Blessed. It’s a word that often makes my skin crawl. “I’m so blessed.” I cringe at the statement, hoping no one else can see the involuntary shudder. Blessed is a perfectly biblical word, so what’s the big deal? Aren’t you being cynical? Surely, you’re just bitter because others have what you want. Yes, sometimes it’s hard to rejoice, but there’s no cynicism here. 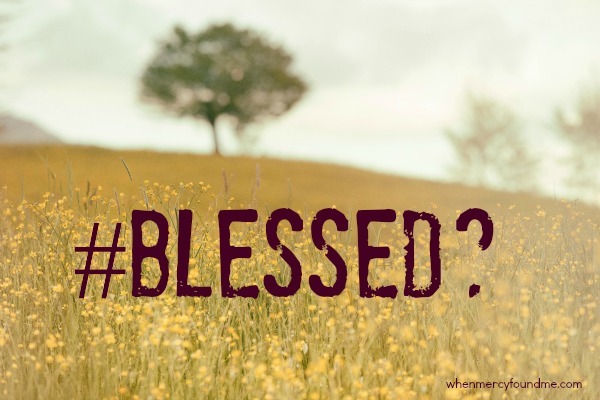 I cringe because “blessed” seems to be merely a trend, a cliche, another word hijacked of its rich meaning. < Previous Fear. With the force of many waters. Next > It’s heaven because Jesus is there. Ami, I love this. We all have the potential to be #blessed we just need to believe and have complete trust and faith. Thanks for the reminder and helping me start my morning off right. Thanks Stacie. It’s something I’ve been thinking about for awhile. And it’s a lovely conclusion to realize that being blessed isn’t based on my daily circumstances, but on the fact that Christ took God’s wrath for me. Thanks for taking time to encourage!